Rockstar is hard at work to improve every facet of their Wild West Experience. 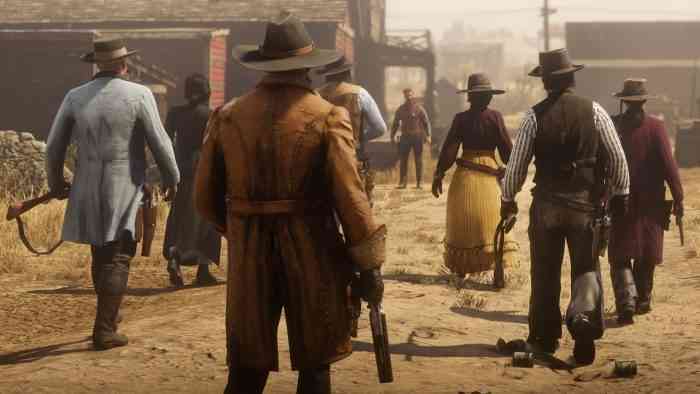 To that end, they’ve decided to deliver new gameplay modes and incentives to Red Dead Online. Starting next week, keep an eye out for some fresh new content. On February 26th, Red Dead Online will see its very first batch of new items and emotes. Players can count on new weapons, new clothing, and new emotes to earn. New additions will arrive alongside your traditional list of gameplay improvements. There will be more to do in the open world, too. The latest free roam events will enter in the form of Fool’s Gold and finishing challenges. With Fool’s Gold, a multitude of players will compete to nab a golden piece of armor that nets extra points for kills. Players wearing the bucket also receive extra hit points but paint themselves an expensive target. According to a press release, competitive cowboys and cowgirls can also look forward to a new set of Showdown modes. New modes in question will arrive in the form of Up in Smoke, Spoils of War and Plunder. No details have released as of yet, so check back for more as we approach the Red Dead Online update. Just before its arrival on February 26, the upcoming weekend will provide 20% bonus XP to all players. Fans of fishing will have endless access to lakes and rivers with the new free roam event. Don’t have the equipment? No worries! Fishing Challenges will give players all the bait they need. The goal is to catch the most weight in fish before the timer runs out. And because this is an event, no one will come around to shoot players in the back, though they might be tempted with the new Evans Repeater and Rare Shotgun scheduled to reach the gunsmiths and catalog. Stay tuned. Red Dead Redemption 2 is available now for the Xbox One and PS4.